A special thank you to Dr. Tsu-Tsair Chi for permission to reproduce this informative article for you. This is an article that every woman should read. Estrogen levels are supposed to decline as we age, especially for women after menopause. But there is an increasing trend of abdominal obesity, heart attacks, stroke and even cancer, all of which have a common denominator: Excess estrogen. Do you have excess estrogen? 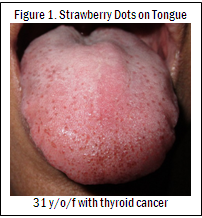 If your tongue has red or strawberry dots (Figure 1), you definitely have estrogen dominance. Cherry angiomas, which may be located on your torso/chest (Figure 2) or on your forehead (Figure 3), can also mean estrogen dominance. This means that excess estrogen is attacking your peripheral blood vessels, causing them to burst and form the angiomas. It has been proven that the appearance of these red dots or cherry angiomas is strongly associated with estrogen-dominant conditions like fibrocystic breasts, ovarian cysts, and more. If the angiomas are located on the forehead, this indicates a high chance for stroke or aneurysm. If you have hypertension and a family history of stroke or aneurysm, the risk is 8 times higher. Estrogen dominance can also manifest as skin discoloration on the cheeks, called melasma (Figure 4). It is no surprise that excess estrogen would increase the risk for hormone-responsive cancers like breast, endometrial, or ovarian cancer. But the incidence of cancer is actually higher among older adults. In fact, breast cancer incidence is higher among postmenopausal women. The incidence ratio is actually 1 in 6 women over 80 years old. And among women over 70 years old, more than 70% of breast cancer cases are estrogen dominant (Source: W Myeroff. “Women over age 70 DO get breast cancer.” Erickson Tribune). Even after menopause, when estrogen production from the ovaries stop, estrogen is still being produced elsewhere. Fat, especially around the abdomen, has high levels of aromatase which fuels more estrogen production. R. B., a 68 y/o/f from NY, had an ovarian cyst in 2000. The following year, it developed into ovarian cancer. She later had surgery. The cancer recurred in 2011 and she again had surgery for it. In Oct 2015, ovarian cancer was found for the 3rd time. She underwent chemotherapy and is preparing for surgery now. 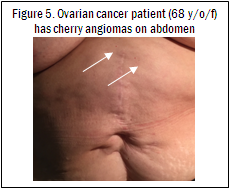 Indeed, she has cherry angiomas on her abdomen (Figure 5). B.C., a 55 y/o/f from NY, has ductal carcinoma in situ on the right breast. 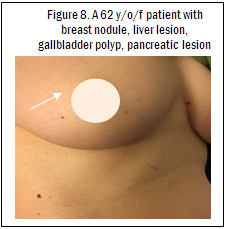 She just had lumpectomy (Figure 6). B.C., a 42 y/o/f from NY, has a breast tumor. She, too, has cherry angiomas (Figure 7). H.N., a 62 y/o/f from NY had the following results but the oncologist told her everything is fine. She does have cherry angiomas on her chest and abdomen (Figure 8). It is a well-known fact that Hormone Replacement Therapy (HRT), including bioidentical ones (BHRT) and even birth control pills come with cancer risks. In fact, when a doctor prescribes birth control or HRT, he or she always precautions about the cancer risks involved. Studies show that HRT users have a 63% higher incidence of breast, ovarian and endometrial cancer combined compared to non users (Sources: Lancet. 2007 Apr 10; JAMA. Nov 2009). Even BHRT users also have issues due to hyperaromatization of testosterone to estradiol.In the following case, we see how important it is to be aware if we’re estrogen dominant or not. And if we are, it is best to avoid HRT or BHRT in order reduce our risk for estrogen-responsive abnormalities. If HRT or BHRT is absolutely necessary then Myomin should be added to minimize the associated risks.P.S., 58 y/o/f from CA, always had dense breasts for years. About 8-9 years ago, even before menopause, her doctor gave her an estradiol transdermal patch and progesterone cream. Her breasts enlarged from a size B to a size D and she had subsequent breast reduction surgery. A few years later, a mammogram in showed some abnormality. Then she was diagnosed with ductal carcinoma in situ (E receptor 2+). And a pelvic ultrasound showed her endometrial lining was 12mm. Not surprisingly, her estradiol and progesterone levels are high. Her Pg/E3 ratio is under 200, which means that she is indeed estrogen dominant. She is now on Myomin and Angiostop. For those on HRT or BHRT, it is important to add Myomin in order to reduce the risk of cancer. ANGIOSTOP is a natural angiogenesis inhibitor that blocks new blood vessels from feeding the growth. It is also a receptor tyrosine kinase inhibitor (RTK) able to block 5 different RTKs: VEGFR, EGFR, PDGFR, FGFR and IGFR. Many types of estrogen-responsive cancer express various RTKs, especially IGFR. So far no cancer drug is approved as an IGFR inhibitor. But Angiostop has already been shown in a genetic test to inhibit IGFR by 19%. So at the first sign of a growth or even if you just suspect it, take Angiostop right away. In the Women’s Health Initiative Study, it was already learned that estrogen, either alone or in combination with progestogen, increased stroke and heart attack risk. The risk is even higher for older women ( Climacteric. 2012; 15(3):229-234). Furthermore, several studies showed that HRT is associated with a 39% increase in ischemic stroke and a 56% increased rate of death from stroke ( Curr Vasc Pharmacol. 2008; 6(2):112-23). Estrogen dominance is actually more prevalent in the older adults. So once you reach 40 years old, check for strawberry dots on your tongue or cherry angiomas. If you see either one, especially if you see cherry angiomas on your forehead as well, you need correct estrogen dominance as well as reduce your risk for cardiovascular problems.MYOMIN is an excellent natural aromatase reducer to help reduce estradiol and increase testosterone. As we get older, more testosterone is getting converted into estrogen so we need to stop this process in order to achieve balance.VEIN LITE, OXYPOWER and ASPARAGUS EXTRACT are recommended for improving cardiovascular function. If you see the cherry angiomas on the forehead, check your C-Reactive Protein (CRP) and homocysteine levels. CRP should be less than 1 and homocysteine should be around 6. OxyPower and Vein Lite can help reduce CRP while Asparagus Extract and Vein Lite can reduce homocysteine.For more information on cardiovascular disease, please read our January 2017 and April 2017 newsletters. Click here to subscribe to our YOUTUBE Channel to watch Dr. Chi discuss more physical markers. Whenever you see red dots on the tongue or cherry angiomas on the chest or abdomen, this should already alert you of an estrogen-dominant problem. We have seen it proven in so many cases; some of them were presented here. These markers are strongly related to problems with the breast, ovaries, prostate and other reproductive organs. Sometimes they may have already progressed to cancer, like in the cases we have seen. Or if the cherry angiomas are located on the forehead, they signify a cardiovascular issue. So if you see red dots on the tongue or cherry angiomas on the torso, Myomin is recommended, especially if you are also in HRT, BHRT or birth control pills. If there is a risk of cancer involved, add Angiostop right away. If you see cherry angiomas on the forehead, Vein Lite, Myomin, OxyPower and Asparagus Extract are recommended to reduce the risk of cardiovascular disease. Don’t miss our next issue on Estrogen Dominance in Men. TRY MYOMIN NOW FOR ESTROGEN DOMINANCE! If you have any comments or questions regarding this article please post this on our Facebook page or on our Twitter page for Glen Depke to address personally. You can also call our office direct at (800) 960-2755. Next post Feeling Depressed, You Must Be Deficient in Prozac? Previous post What's In Your Poop?